In contemporary Western Buddhism, some teachers use prostrations as a practice unto itself, while other teachers relegate prostrations to customary liturgical ritual, ancillary to meditation. In the Pali canon, laypersons prostrating before the then-living Buddha is mentioned in several suttas. In Theravada Buddhism, as part of daily practice, one typically prostrates before and after chanting and meditation. On these occasions, one typically prostrates three times: once to the Buddha, once to the Dhamma, and once to the Sangha. More generally, one can also prostrate before "any sacred object of veneration." In Theravadin countries such as Sri Lanka, when one goes before one's teacher, in order to "open one's mind up to receive instructions," one bows and recites the phrase, "Okāsa ahaṃ bhante vandāmi" ("I pay homage to you venerable sir"). How well, too, I remember the first time I came before my teacher in dokusan. As you know, it is customary to prostrate oneself before the roshi as a sign of respect and humility. But how that went against my grain, and how I resisted it! "... [W]hat does all this have to do with Zen?" My teacher, well aware of these thoughts within me, said nothing, viewing my frustrated maneuvers at each dokusan with an amused smile. Then one day, when I was having a more awkward time than usual trying to prostrate, he suddenly shot at me, "Kapleau-san, when you make prostrations in dokusan you are not bowing down before me but before your own Buddha-nature." The Zen student is taught that in raihai [prostration] one throws everything away. Pivoting the forearms on the elbows and raising the hands [palms up] while prostrated is the act of raising the Buddha's feet above one's head. The act of unself-conscious prostration before a Buddha is ... possible under the impetus of reverence and gratitude. Such "horizontalizings of the mast of ego" cleanse the heart-mind, rendering it flexible and expansive, and open the way to an understanding and appreciation of the exalted mind and manifold virtues of the Buddha and patriarchs. So there arises within us a desire to express our gratitude and show our respect before their personalized forms through appropriate rituals. Zen master Huang Po, of the 9th century, is said to have done prostrations so intensely that he wore a permanent red mark on his forehead. In Vajrayana Buddhism, prostrations are often performed before meditation or teachings, but can form a separate practice by itself. Prostrations are seen as a means of purifying one's body, speech and mind of karmic defilements, especially pride. Prostrations are used in tandem with visualization and can be used to express reverence to Guru Rinpoche and others. ...Bring your hands together in the 'lotus bud' mudra (the base of the palm and the fingertips together, and thumbs slightly tucked in) and place them on the crown of the head, then to the throat and heart. As you place your hands on your crown, you offer homage to Guru Rinpoche's enlightened body, purify defilements and obscurations incurred through the avenue of your body, and establish the potential to realize nirmanakaya. At your throat, you offer homage to his enlightened speech, and establish the potential to realized sambhogakaya. Bringing your hands to your heart, you offer homage to his enlightened mind, purify your mind's obscurations, and establish the potential to realize dharmakaya. This type of prostration is often done 3, 7, 21, or 108 times. A prostration mala can be used to facilitate counting. ↑ See, for instance, Tromge (1995), pp. 87-96. ↑ See, for example, Aitken (1982), pp. 29-31, where he discusses such rituals as having a twofold purpose: "First, ritual helps to deepen our religious spirit and to extend its vigor to our lives. Second, ritual is an opening for the experience of forgetting the self as the words or the actions become one with you, and there is nothing else." (p. 29). ↑ Khantipalo (1982). In addition to making this general statement, Khantipalo quotes an example of lay people prostrating before the Buddha from the Kalama Sutta (AN 3.65). ↑ Indaratana (2002), p. v.
↑ Indaratana (2002), p. v. Khantipalo (1982). ↑ Bhikkhu Bodhi (2006), Sn 2.9 Kiṃsīla Sutta — Right Conduct (lecture) at time 25:20, available as "Sn032" (mp3) from "Bodhi Monastery" at http://www.bodhimonastery.net/bm/about-buddhism/audio/903-audio/84-sutta-nipata.html. 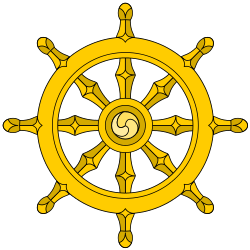 Before a nun (as opposed to a monk), one would presumably use ayye instead of bhante. ↑ Kapleau (1989b), p. 191. ↑ Aitken (2002). See a similar statement in Aitken (1982), p. 30. ↑ Here Kapleau is referencing a letter by 14th-century Rinzai Zen master Bassui Tokushō to a layman: "As for the practice of bowing down before the Buddhas, this is merely a way of horizontalizing the mast of ego in order to realize the Buddha-nature" (Kapleau, 1989a, pp. 182-183). ↑ Kapleau (1989a), p. 21. ↑ Kapleau (1989b), p. 192. ↑ Tromge (1995), p. 87. ↑ Tromge (1995), pp. 88-9. ↑ Tromge (1995), pp. 94-5. ↑ Tromge (1995), p. 95.